For today's post I have a card using the Ruby Fairy image from DigiStamp Boutique. I colored her with Copics and then covered her wings, wand and crown in glitter. The wish sentiment was cut out using my Cuttlebug Olivia alphabet set. After I added the letters to the card I decided they needed some glitter too so I colored them with a glue pen and applied a coating of glitter. You can see another posting using the Ruby Fairy image here or in the DigiStamp Boutique gallery. Thanks so much for stopping. I hope you're having a wonderful day! Happy Stamping! 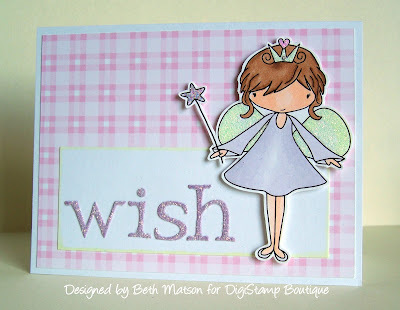 Oh so cute - love this little fairy and sparkly wish sentiment! Great card Beth! Adorable! Love the glittery letters. Love this little fairy, thinking it would make some great birthday invitations! So darling - great card, Beth!